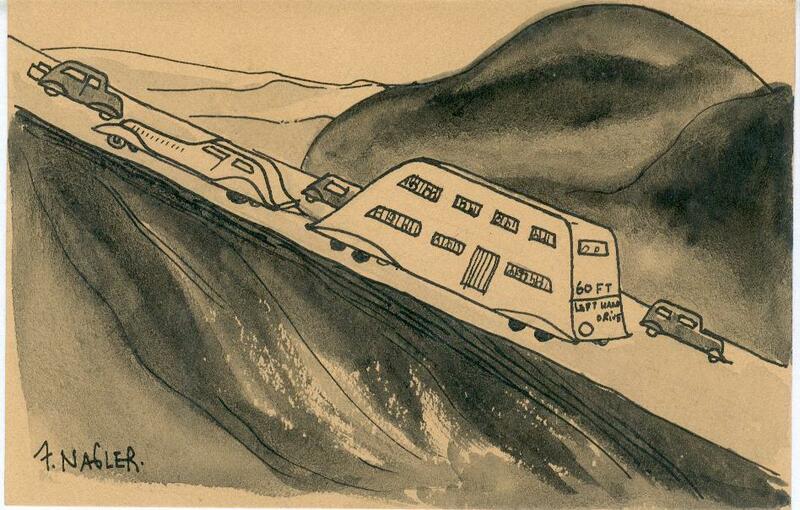 Friedrich was interned by the British in 1939 and deported to Canada, departing from Fleetwod, Isle of Man, on the SS Sobieski. 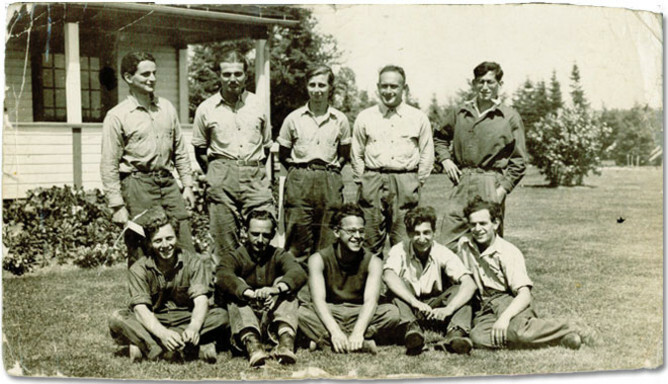 The Vancouver Holocaust Education Centre has a record of Friedrich's internment in Camp B (Ripples, New Brunswick) in its 'Enemy Aliens - The internement of Jewish Refugees in Canada, 1940 - 1943' webpage - click here. 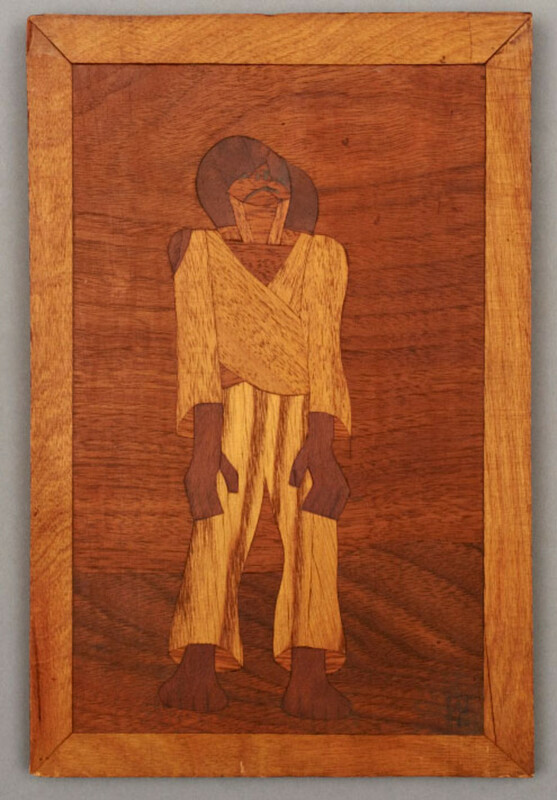 An image of 'Man Looking-up', by Friedrich Nagler, wood-block art 1941, Camp B (Ripples, New Brunswick) is shown above, and in the pictures below. This is the earliest art work definitively attributed to Friedrich. The Enemy Aliens website also has a group photograph of internees at Camp B (Ripples, New Bruswick) on page 1 of the dossier. This photo is shown below and Friedrich is almost certainly the circa 20 year old young man wearing spectacles seated centre at the front. Friedrich was encouraged by Prof. Fred S Haines (President of the Royal Canadian Academy of Arts) to apply for a scholarship at the Ontario College of Art and he was subsequently offered this. Unfortunately, the scholarship didn't include any maintenance funds, so he had to turn the offer down - he was penniless. Friedrich worked mainly as a lumberjack at Camp B, and he enjoyed working in the beautiful forests. However, he found the experience too cold and successfully applied to return to England. He arrived back in England on the SS Aquitania in 1943 and was interned near Oxford. 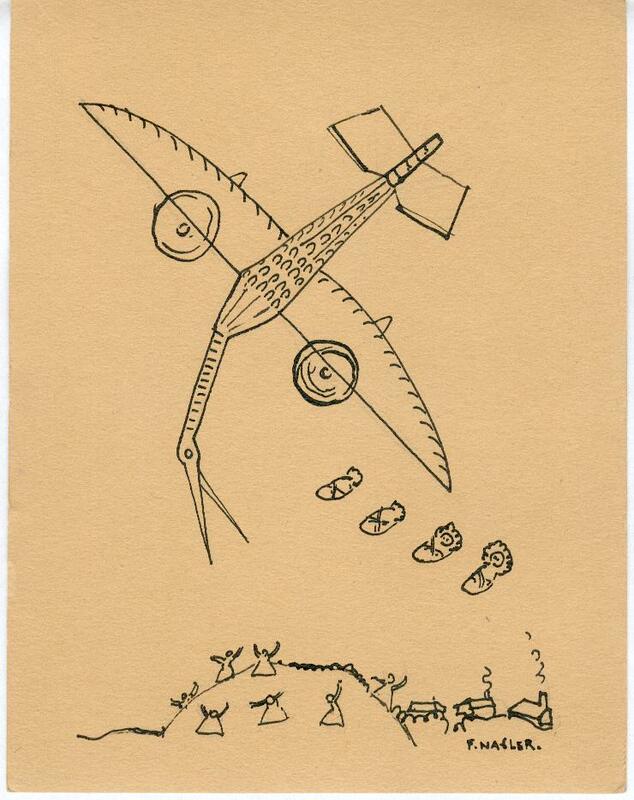 Also included in the photos below are two of the post-card size pen & ink 'cartoon' sketches likely drawn in Canada and possibly part of the portfolio that Friedrich used to win his scholarship to art college.